This demo workshop will cover handbuilding and throwing techniques for the making of tea ceremony bowls, tea pots, water jars, ikebana vases, and sculptural objects. 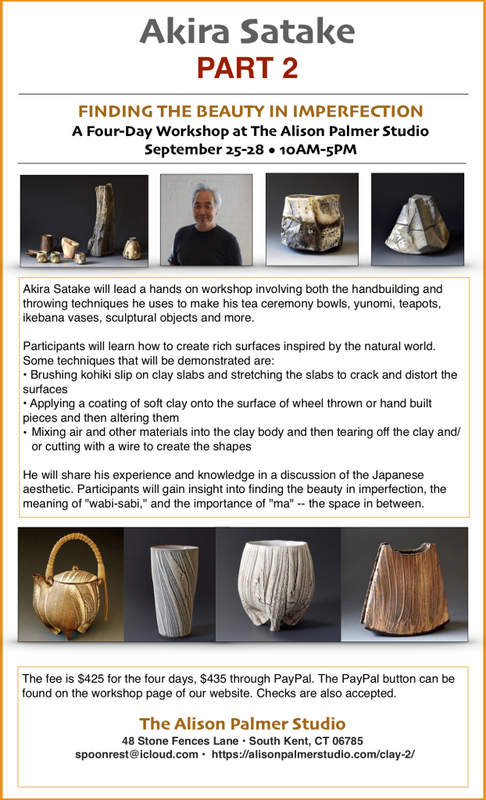 A hands on workshop involving both the handbuilding and throwing techniques he uses in the making of his tea ceremony bowls, teapots, ikebana vases, sculptural objects and more. For beginners through advanced (hand building students are welcomed). A hands on workshop involving both the handbuilding and throwing techniques Akira uses to make his tea ceremony bowls, teapots, ikebana vases, sculptural objects and more. 2 days work shop at Methodist University. Akira Satake leads a five-day, hands-on workshop focusing on slab construction techniques and Kohiki slip decorating for creating functional pottery forms. Participants will learn to work both with soft and hard slabs, exploring a variety of processes and techniques to create teapots, tea cups, pitchers, vases, boxes, and other functional pottery. Invited to be a part of the 10th anniversary year ceramics festival in Gulgong Australia.